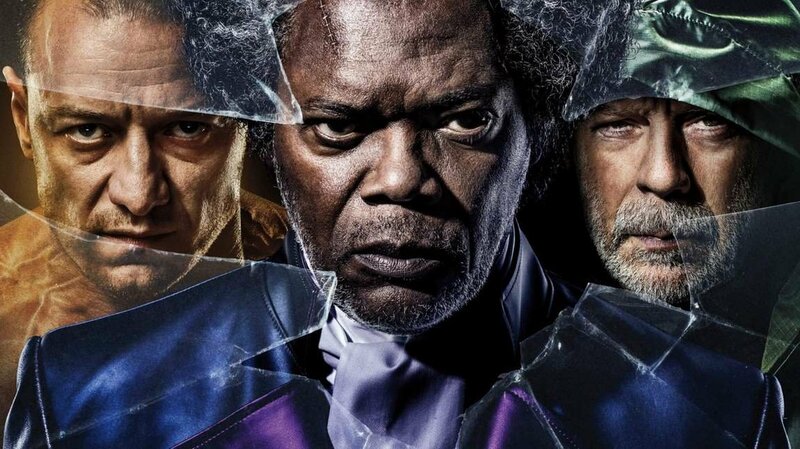 Ralph Potts reviews the Ultra HD Blu-ray release of Glass, Writer-Director M. Night Shyamalan’s comic book thriller that completes a mind-bending trilogy created nearly twenty years ago. 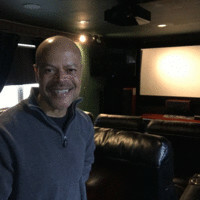 “Glass offers a closer look at the world of the Elijah Price, also known as Mr. Glass (Jackson), David Dunn (Willis), and Kevin Wendell Crumb (McAvoy) as they experience a series of escalating encounters as they escape from an asylum and embark on a thrilling battle of good versus evil.” – Universal Pictures Home Entertainment. M. Night Shyamalan’s Glass brings together the narratives of two of his original films — Unbreakable, and Split, in an all-new comic-book thriller. From Unbreakable, Bruce Willis returns as David Dunn as does Samuel L. Jackson as Elijah Price, known also by his pseudonym Mr. Glass. Joining from Split are James McAvoy, reprising his role as Kevin Wendell Crumb and the multiple identities who reside within, and Anya Taylor-Joy as Casey Cooke, the only captive to survive an encounter with The Beast. Following the conclusion of Split, Glass finds Dunn pursuing Crumb’s superhuman figure of The Beast in a series of escalating encounters, while the shadowy presence of Price emerges as an orchestrator who holds secrets critical to both men. So, I am a fan of both Unbreakable and Split. I was excited when I saw the integration of elements from Unbreakable at the end of Split and looked forward to seeing how M. Night Shyamalan would tie things together. My son saw Glass when it was in theaters and his lack of enthusiasm for it kept me from making the trip myself. As I sat and watched how Shyamalan’s patchwork came together in the first two acts of Glass I was fairly engaged and ultimately hopeful it would prove fulfilling, narratively speaking. 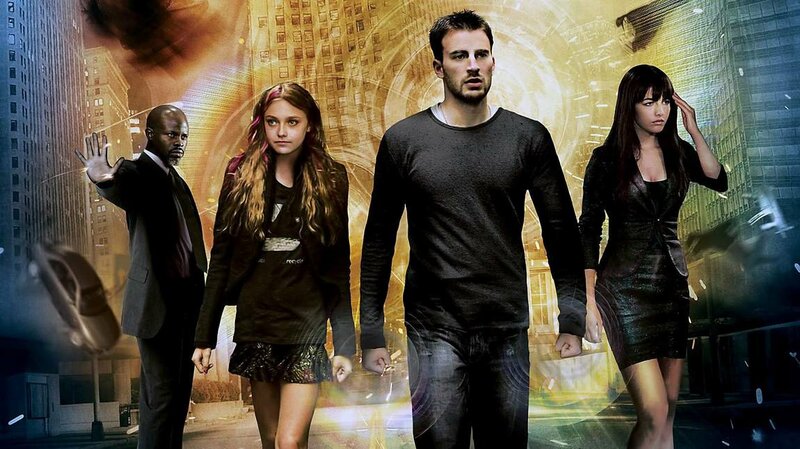 This more or less continued into act three but, that was where the storyline takes an abrupt and odd turn via a series of revelatory elements that seemed feeble and not in keeping with the head of steam that began with the first two films and the potential started in this one. M. Night Shyamalan’s passion for the subject matter and attempts at stimulating the audience with thoughts that provoke his conceptual design are evident but, incoherence suddenly takes a front seat, leaving what I consider to be the most interesting thing about all three films, to flounder. Truly, there are things to like about this film. Shyamalan’s eye for crafty camera work is spot on. There are several encounters/set pieces that are simply fun to watch and watching James McAvoy do his thing by handling the rapid personality changes is amazing. Sadly, Glass just doesn’t live up to its potential and fails to fulfill the promise which began with Unbreakable. I can’t help but wonder what a differing third act would have yielded. Disappointing or not, Glass has something to offer those that enjoyed the narrative threads that span all three films and is worth seeing in that regard. 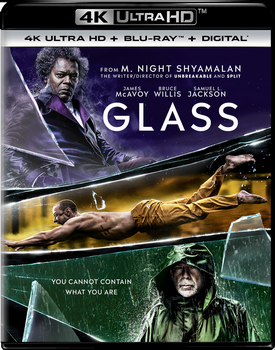 Glass comes to Ultra HD Blu-ray from Universal Pictures Home Entertainment featuring 2160pHEVC encoded video and lossless Dolby Atmos/TrueHD 7.1 channel sound. For its presentation in Ultra HD Glass was derived from a 3.4K source, and rendered from a 4K DI. From a cinematic perspective, this film was shot with a specific visual aesthetic in mind and that comes through in this presentation. At times the image is nearly devoid of color, while at others, has a pleasingly diverse palate, that sets the mood of a scene. Shot digitally, the image has a smooth aesthetic, with clean delineation that draws out plenty of detail, in both close-up and wide-angle camera shots. Blacks are deep without compromise to fidelity, as the layers of detail seen with them is readily apparent. Contrast abounds as the richness of the depth seen in grays, whites and mid-tones pops in the film’s variety of low-level sequences. Fleshtones adhere to the film’s visual aesthetic and appear consistent throughout the presentation. As I alluded to earlier Glass isn’t a predominantly colorful film however its cooler chromatic hues, sepia tones and variants of blue/red benefited from UHD’s wider color gamut, appearing warmer and pleasing to the eye. There is intermittent use of visual elements that utilize high dynamic range. I wasn’t especially impressed with its application although some of that may be owed to the nature of the photography. There were instances where bright elements looked appreciably vibrant but, none really stood out. This Ultra HD rendering makes the most of the film’s elements, which are excellent. Looking at the 1080p version, which is solid in its own right, the difference is noticeable, but not what I would describe as night and day. That being said, there is no question about which of the two makes for the most engaging viewing experience. In listening to the Dolby Atmos surround mix I found it to be of the active variety that made effective use of the platform. Its use of audio objects placed above is a blend of atmospherics and discrete effects. When applied it creates an appreciable level of immersion that coincides with the onscreen events. There are many instances, such as David’s warehouse encounter with The Beast, that show off the track’s thematic blend of music and, well placed object sounds that create a wonderfully involving listening experience, that broadens the soundstage. I enjoyed the balance of atmosphere as well as the integration of discrete object placement. I think that it complimented the source material and drew me into the film when it mattered most. Glass comes to Blu-ray Disc from Universal Pictures Home Entertainment featuring 1080p AVC encoded video and lossless Dolby Atmos/TrueHD 7.1 channel sound. This is an excellent high definition rendering that sports plenty of fine detail and crisp definition that provides discerning dimensional perspective. Colors range from warm and vivid to cool, reserved and almost tonally neutral. This is obviously a creative decision that draws definitive visual boundaries and works quite well. Contrast is strong and blacks are deep without compromise to delineation. Shadowy areas exhibit excellent depth of field and visible gradational stages. Framed at 2.39:1, images onscreen have excellent depth, and a stimulating visual aura. I didn’t see any signs of video degrading artifacts or extraneous compression related noise. Glass looks great on Blu-ray. The lossless Dolby TrueHD 7.1 channel (Atmos core) soundtrack has good dynamic range, detail rich clarity and makes ample use of the surround platform to drive the film’s elements. The detection of subtle background sounds, off camera cues and spatial dimension within the room’s acoustic environment is notable. Discrete rear channel activity isn’t extensive however, the elements of action provide an enriching level of immersion which is punctuated by palpably rich bass. Dialog is firmly planted in the center channel and renders voices and effects with appropriate distinction. This surround mix capably handles the subtle intricacies thrown at by this soundtrack as it augments the thematic tone of this film. • Bringing the Team Back Together – M. Night Shyamalan is famous for working with many of the same crew from film to film. In this piece, cast and crew share personal stories of why Shyamalan’s productions feel like seeing family again. • Breaking Glass: The Stunts – The superhuman strength of The Beast is best illustrated in the stunts. Take a behind the scenes look into the very effective methods of executing stunts in the film. • Connecting the Glass Universe – Explore M. Night Shyamalan’s stylistic approach to the Glass trilogy and the unconventional concept of a comic book movie grounded in reality. • M. Night Shyamalan: Behind the Lens – Cast and crew discuss Shyamalan’s dedicated and meticulous approach to storytelling. 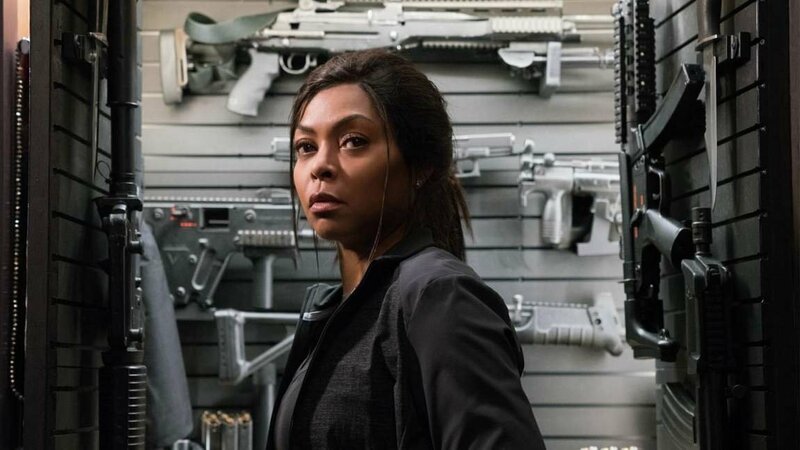 • The Sound of Glass – Composer West Dylan Thordson elaborates on his use of string instruments to create tension, and explains why recording the score on-location enhanced the tone of Glass. • Enhancing the Spectacle – The VFX team provides details on the rewarding task of using CGI as an effective tool to intensify the narrative of Glass. • Raven Hill Memorial – Roam the long corridors of Raven Hill Memorial Hospital and see why the cast and crew describe the eerie location as its own character in the film. • Night Vision – A look at the early stages of Glass by examining the storyboards and their remarkable similarity to the final shots in the film. M. Night Shyamalan’s Glass brings together the narratives of two of his original films — Unbreakable, and Split, in an all-new comic-book thriller. Sadly, it just doesn’t live up to its potential and fails to fulfill the promise which began 19 years ago with Unbreakable. It comes to Blu-ray from Universal Pictures Home Entertainment in this Ultra HD Combo Pack featuring excellent overall image quality, terrific lossless surround sound, including an invigorating Dolby Atmos immersive sound mix and, a worthwhile assortment of bonus materials. 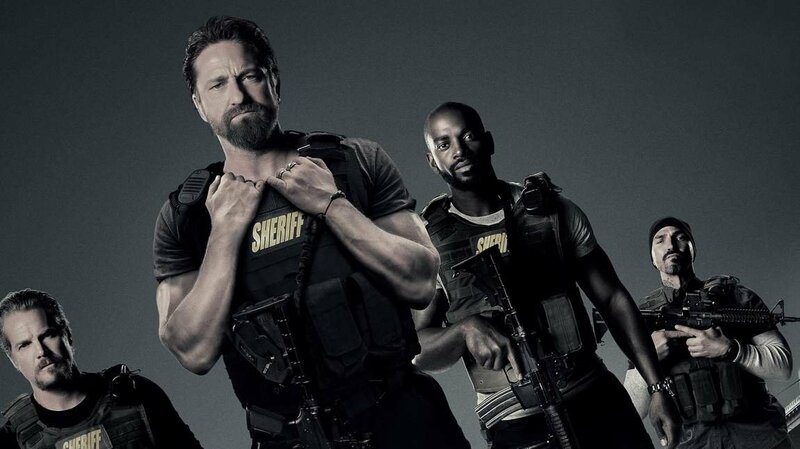 Despite being somewhat disappointed in Glass I think it deserves consideration for a place in the collections of diehard series fans. Give it a rent on Blu-ray and decide for yourself.